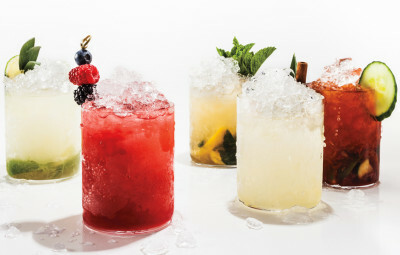 For a while in the summer, I started researching really simple whisky cocktails. When I say simple, I mean like no more than a few steps and five ingredients. A Manhattan is pretty simple. Bitters, whisky, and vermouth. Another simple one is called a Whiskey Smash and I found a recipe in Bon Appetit magazine. Mash the leaves and the lemon along with the tablespoon of simple syrup. Add the bourbon or some other whisky. Transfer to a glass filled halfway with crushed ice.